It should go without saying that when you’re in bed, you deserve to be comfortable. Whether you’re sleeping, reclining, or doing something like watching TV or reading, having a bed that works with you can make a world of difference. While you can prop yourself up with pillows and cushions and be fine in the short term, you can easily develop long term problems in your neck, back, and other points of stress that can really put an unnecessary strain on your body. Whether you’re a young person who wants to get the most out of their bedroom TV or an older person who finds it difficult to sleep comfortably though the night, the solution is the same; the best adjustable bed. View this week's best deals on the best adjustable bed! What Should You Look For in an Electric Adjustable Bed? Essentially they are electric beds, or exactly what the name implies. They’re beds that adjusts the mattress to your body, rather than the other way around. Your most common models are going to be simple mattresses with electronic bases that can be controlled with a remote, either hard-wired into the base or controlled with a wireless remote. As you move up the ladder, you can find mattresses that have massage motors, heated mattress pads, Memory foam, and even Sleep Number technology that adjusts on its own to give you the right balance of firmness for a good night’s sleep.Other than that, the concept is fairly simple and designed to keep you comfortably positioned in bed without the need for pads and cushions, giving you a more restful night’s sleep, a more comfortable place to read or watch TV, and a better way to get the most out of your bed. If you’re an average adult, you’re going to be spending at least eight hours a night asleep; it just makes sense that if you spend those eight hours in an uncomfortable position, you can quickly develop problems with your back and neck, as well as general points of pressure that create “knots” in your muscles that make restful sleep impossible. The problem, however, isn’t in your mattress itself, but in the entire concept of a flat mattress; your spine isn’t naturally straight, so forcing it up against something that is is just going to cause problems. With an adjustable bed, you can get a mattress that makes sense with your spine’s natural curve, and greatly reduce pressure on any one point of your body. Relieving pressure with an adjustable mattress doesn’t just help your muscles and joints, but can also help with breathing and circulation. With a more natural sleeping position, you can breathe easier and your blood can circulate more freely, helping those of you with problems like snoring, pain in your limbs, and just a general feeling of fatigue even after what was supposed to be restful sleep. When you’re looking for an adjustable bed for a couple, it’s important to remember one important thing; you and your partner aren’t going to agree on the same sleep position all the time. While one of you might want to sleep completely flat, the other may want to stay up late in a reclined position, and on even the best adjustable beds, it will unfortunately have to be one or the other. At best, you’re only getting half the use out of your adjustable mattress that you’d normally expect, and at worst, it becomes useless; unless only one person is going to be in bed at a time, you’ll have to adjust yourself with pillows and cushions, which is essentially what you’d be doing on a much cheaper traditional mattress. What you really need to get the most out of your bed, particularly if you and your partner have different before-bed rituals, is an adjustable split king bed. Fortunately, Leggett and Platt have made a middle ground that gives both parties control over their respective sides. Using two separate remotes, each half of this S-Cape adjustable bed can be adjusted to your preference without affecting your partner in the slightest. The result is a bed worthy of Leggett and Platt’s traditional standard of quality, and a great way for even couples with incompatible sleep schedules to share the benefits of a bed that adjusts. Not surprisingly, the real star attraction on this king-sized adjustable bed are the split controls. What you get with this bed are two separate remotes that give you complete control over your respective sides, giving you options to adjust head and foot elevation as well as head and foot massage and intensity. Using whisper-quiet motors and a Wallhugger design, you can adjust yourself even in the middle of the night and your partner won’t be disturbed in the slightest. Every night doesn’t have to be its own guess and check either, thanks to your remote’s ability to save two custom settings; tinker with your mattress for a bit and you can easily switch between a set reading or TV watching position and sleep position with just the touch of a button. Even adjusting down to a completely flat head and foot is just pressing a single button as well, so even people who are used to a traditional mattress have an easy one-button solution to return to something familiar. With this mattress, you’re getting a lot of options in a user-friendly package that, once again, doesn’t bother your partner in any way. Of course, the adjustable system isn’t the only thing that this package has going for it. With this adjustable bed frame, you’re also getting a set of CoolBreeze GEL mattresses designed for comfort. Rather than using the traditional spring set you’re probably using on your traditional mattress, the CoolBreeze setup is a mix of four different kinds of material, none of which have hard pressure points. On top, you’ve got a layer of gel foam, which is essentially improved Memory foam. Like memory foam, this material is going to absorb energy and hold its shape, but unlike regular Memory foam, this gel foam comes with a mixture of cooling gel beads, designed to improve airflow and keep you cool throughout the night. Under that, you’re getting a layer of material that’s also designed to keep air flowing throughout your mattress, giving the gel beads extra air to work with to keep you cool, all on top of a solid foam base for support that adjustable bed reviews love to rave about. Combine the adjustable frame with these two CoolBreeze GEL mattresses, and you not only have a fully adjustable system, but one that can give you complete comfort in any position. We’re not going to kid around here; comfort isn’t some metric that is the same for everybody. If you’re sharing your bed with somebody else, it doesn’t make sense to assume that their comfort is the same as yours, and if they’re not going to be comfortable on a new traditional adjustable bed, then it’s going to cause more problems than it fixes. With split adjustable beds, particularly those from Leggett and Platt, you can have the best of both worlds; you get a mattress that can adjust to each person’s shape individually without disturbing the other. In addition to the completely adjustable bed frames, the medium firmness and airflow in the CoolBreeze GEL Mattresses means that you can sink directly into your bed without the need for propping cushions or the worry about hard pressure points. It’s an entirely flexible system, but more importantly, with individual settings, it can be flexible to both parties individually. With as many satisfied customers raving about this mattress online at places like Amazon.com and others, it’s simply one that will meet your needs from day one. Finally, after years of only being available in hospitals, the technology for adjustable beds has finally improved enough for home use. The best part? Just because the technology came from the medical field doesn’t mean that adjustable beds have to look like medical equipment anymore. In addition, it isn’t just the elderly that can benefit from this amazing technology anymore; young athletes that need quicker recovery and relief can now use bed like this to fill that bill. Professionals who are on their feet all day can prop them up, turn on the massaging action, and be ready to do their jobs again the next day. While they may be a helpful measure for the elderly, they’re also a great bed for young couples, giving you the ability to deal with pressure point pain before it ever becomes a problem. If you’re in the market to try this medically proven technology, you can’t go wrong with the DynastyMattress S-Cape Adjustable Bed from Leggett and Platt. What you’re getting with the full-size DynastyMattress setup is all the basics of a great adjustable bed without compromising the look of your room. For starters, you’re getting the adjustable head and foot settings, as well as adjustable dual massage that travels up and down your back (thanks to Wave technology) and a Wallhugger design, all controlled through a wireless, programmable remote. If that didn’t make sense, don’t worry; what it means is that you can adjust the elevation of your head, the elevation of your feet, and massages all the way throughout, perfect for reclining to watch TV or read comfortably, while the Wallhugger engineering makes sure you can use the bed’s full range of motion without gouging into your back wall. You can easily save your favorite positions for both sleeping and reading to your wireless remote, and then access them again at the touch of a button. In addition to being comfortable, this design also does speed up recovery, especially in leg muscles. By elevating the legs, you’re able to return blood that has “pooled up” in your legs back to your body, helping your blood circulate fresh oxygen into sore muscles and promote a faster recovery. If you’re the kind of professional who spends a lot of time on your feet, or an endurance runner who needs quick recovery after a long training session you’ll really notice a difference after a night with a DynastyMattress setup. Of course, all the adjustability and functionality in the world doesn’t matter if your mattress doesn’t feel comfortable. Fortunately, Leggett and Platt have that covered already with an included mattress with their adjustable base that’s half memory foam and half high resilience base foam. This way, you can have a mattress that conforms to your body while remaining firm and allowing fresh air to circulate throughout. You can keep the existing mattress or choose to upgrade to one of Leggett and Platt’s other great full size adjustable bed mattresses, like the GEL mattress, to get your most comfortable night’s sleep in any position. Reviews for the DynastyMattress setup have been consistently positive all across the board. From delivery to setup to function, adjustable bed reviews all across Amazon have given this system high marks with no ratings lower than three stars. After a few weeks of use, some reviewers are reporting huge benefits to their health, such as relieved tension all across the back and even relief from problems like acid reflux. Even though the unit weighs over 150 lbs, people are still saying that assembly is easy enough for anyone to do, and the results are terrific. At a fraction of the price of other name brand sleep systems, the DynastyMattress proves that something doesn’t have to be expensive to be impressive. What you’re going to find with the DynastyMattress adjustable bed setup is that it’s the complete package; it’s going to do everything you’d expect on an adjustable bed without looking like one at all. That being said, however, this is a full-size bed, so it’s only going to sleep one person at a time, which means that it’s going to pretty much be confined to singles. Of course, if you’re a young professional or an athlete living on your own and are looking for the best night’s sleep you can get, you can do a lot worse than having the DynastyMattress in your home. While you may see a lot of adjustable bed frames and hear about all the health benefits they provide, you’ve probably also noticed that the technology is expensive. On average, the electronic adjustable bed setups are going to cost around $1500 or more, especially king size versions, which can, unfortunately, put them out of the price range of a lot of consumers. In addition, the fact that each of these electronic setups require a wall plugin can be a bit of a challenge; if you’re trying to furnish an adjustable bed in a guest room, it may use (and cover) the only available plug in the room. It’s true that the technology driving the adjustable bed frame is rather costly, but that doesn’t mean the health benefits need to be out of your reach. If you don’t mind manual adjustment or you just like your old king size mattress, you can always purchase a king size adjustable bed frame from Classic Brands. What you’re getting on this king size frame is something that’s short, sweet and to the point; it’s an all metal frame that doesn’t even require tools to assemble and eliminates the need for a box spring. 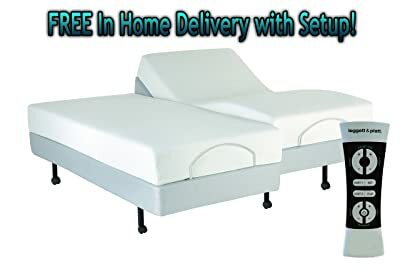 Once it’s in place, all you need to do is put a mattress on top and this setup is entirely ready to go, complete with an adjustable head piece. When you need to adjust your king size frame, all you need to do is to adjust a few metal slats on the back to the proper height and your mattress is propped up perfectly, without the need for pillows and cushions. It may not seem like it, but having your mattress conform to your reclining posture rather than the other way around is actually much better for you; this way, your mattress can give you support all across your back instead of only on certain pressure points. By spreading your body out over a larger area, you put down much less pressure per square inch, which can really reduce the pressure points that happen with stacks of cushions or pillows, and give yourself a much more comfortable reclining position. In addition to its rugged durability, this king sized frame is incredibly spartan; even though it connects to the floor in twelve places, it doesn’t have any additional bulk at all. This sort of detail is perfect for anybody living in an apartment or any other area where space is at a premium. With a king size adjustable frame from Classic Brands, your bed is only going to be as big as your king-size mattress, while still giving you all the benefits of an adjustable bed frame. The adjustable bed frame reviews on this model are generally positive on Amazon, spread out mostly over the four and five star ranges. Not surprisingly, the positive reviews all pointed to the strictly utilitarian nature of the frame; it sets up easy, holds strong, and doesn’t take up any more space than it needs to. Particularly when they were using a Classic Brands or any other brand of memory foam mattress, reviewers found that this frame gave them all the support they were expecting in a bed frame without the need for box springs or any overly bulky mattresses. 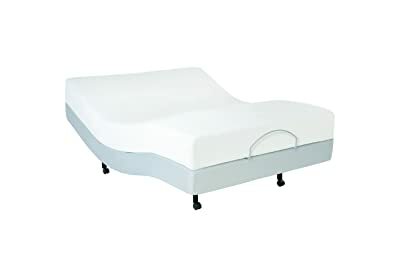 Of course, there are negative reviews on this product as well, and aside from the usual missing pieces complaints, they all point to one problem; as a mechanical bed, it’s slightly more difficult to adjust the head than on other adjustable bed models. This doesn’t point so much to a fault in the frame as it does in its use; this kind of frame really shines when it can stay in one place without constant adjusting and readjusting. Once you get the head set the way you want, you’ll find that this frame will stay in place and do everything you’d expect. This frame is pretty no-nonsense as far as adjustable king bed frames go. It sets up, stays sturdy, and folds back down without any fuss. 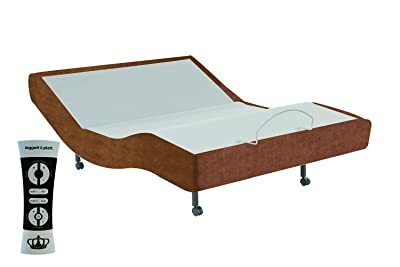 As such, this is the perfect frame for somebody who just wants a simple set-and-forget solution for their adjustable bed, like a college student or anybody moving into their first apartment; it doesn’t take up an outlet and it doesn’t take up space, perfect for anybody who has more important things to worry about. If you do decide to upgrade to an electronic system, it’s still worth it to hang onto this frame as well. Because it can hold a solid head position, you could easily turn this adjustable bed frame for king size mattresses into a futon, or break it down and store it as a guest bed. Either way, this durable little piece from Classic Brands won’t let you down, no matter how long you own it. Does sleep seem to escape you night after night? If so, then you know how important it is to find a way get solid rest. When it comes to the ultimate sleep experience, people are combining two technologies: a memory foam mattress and adjustable bed. Each provides advantages and once they are combined, those advantages are multiplied. If you already own an adjustable bed frame base, then the next line of business is locating the perfect mattress. But, with so many adjustable memory foam beds mattresses today, how can you be certain of which one is ideal for you? Here we will take a look at one of the best adjustable memory foam bed mattress on the market today, the 12-Inch Twin XL Deluxe Memory foam mattress for adjustable bed base. Unlike many other types of mattresses currently available, this one has allowances to adjust itself in order to conform to your bodyline. All memory foam mattresses are made up of several layers, and that’s where this Twin XL Deluxe mattress has made it all happen. Adjustable bed reviews on Amazon reveal many many happy owners (over 100) that have made this twin size mattress their own. As any other 12-inch foam mattress, the Deluxe Memory Foam Mattress will provide you with medium soft to medium firm support. The depth of the top layer is perfect for a cool/optimal sleep temperature, so get ready for restful night’s sleep because in just a few days, you will sleep much better thanks to the firm support and optimal sleep temperature. Now, let’s strip down inside to see what you’re getting. At the bottom, there’s 5-inch Visco-Elastic Memory Foam which helps with maximum support. Above this layer, there’s 7-inch High Resilience Polyurethane Base Foam. It’s the state of the memory foam and high resilience polyurethane base foam that will make your adjustable memory foam bed perfect. You can be sure you will have a comfortable good night’s sleep. The manufacturer DynastyMattress has done a great job with combining both layers and the support you get with the innovative memory foam technology. This mattress is incredibly quiet: it doesn’t whine and creak every time you roll on the other side. It also tends to isolate motion, which means a wave action that’s initiated on one side won’t flip your partner out of bed. Sleeping on this adjustable memory foam bed feels like sleeping on a marshmallow; you will hardly want to get out of bed. Now that you know you no longer will be sleeping with your legs hanging out of bed because you’re too warm, let’s check out the product features. Following are some of the features that make this adjustable base bed special. Buyers claim to sleep better and wake up without back/neck pain. The initial chemical smell is strong when unrolled from the box. More and more people are becoming aware of adjustable base beds and memory foam mattresses, as well as the convenience and benefits they offer. Needless to say, not all bases and mattresses are the same. Every brand has different features that affect quality and value. This 12-Inch Deluxe Memory foam mattress rates as well as, if not better than, other more expensive mattress type currently available on the market. Pressure-point relief and motion isolation are above average. The main complaint people have about this mattress is the initial odor, but one that dissipates with time. 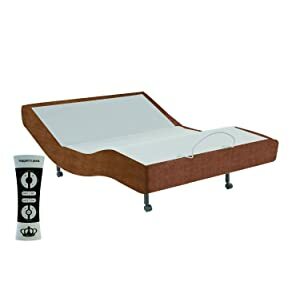 The foam in this adjustable memory foam bed is derived from Visco-Elastic polyurethane that provides great support to your head, shoulders, back, hips and knees while keeping your spine in proper alignment. Sleeping in a comfortable position promotes sound sleep, and furthermore, it ensures waking up rested without pain and aches. Sometimes, bedrooms are small and there’s not a lot of space to work with. So, people skip getting a bed frame for their beds to save on space. The thing is, a bed frame provides the foundation for a good night’s rest and that’s why adjustable bed frames by Classic Brands are such a convenient bedroom furniture option. They can be, you guessed it, adjusted to fit the space that you have and are a smaller, easier to use alternative. 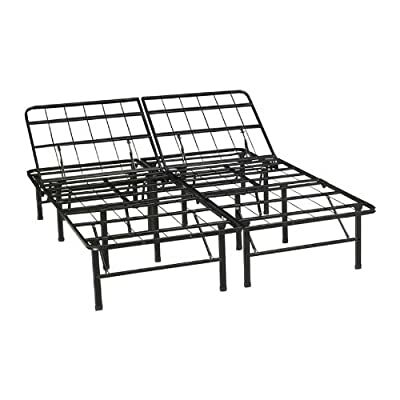 If you want to get an adjustable one, one quality option for queen sized beds is the Classic Brands Adjustable Heavy Duty Metal Bed Frame – Queen Size. Don’t believe it, well, then keep on reading to find out why. Unlike regular bed frames that when set up are essentially immobile, those that are adjustable can be moved effortlessly and are much, much smaller than traditional bed frames courtesy of their convenient design. The Classic Brands Heavy Duty Metal Bed Frame is a prime example of this design. It’s crafted from sturdy metal, yet is lightweight; it’s compact and will fit in tiny areas; and the top of the frame moves up and down to offer optimal comfort. Basically, there are so many features and benefits associated with this product, that it’s necessary to go into more even detail so you can really see what it has to offer. The top half of the frame is manually adjustable and can be propped up into a seating position. It serves as both the frame and the box frame. Is made from metal and features very durable construction. Collapsible, foldable design with simple set-up. Dimensions are 14″ H x 60″ W x 80″ D.
With the features now covered, here are the benefits related to this queen size adjustable bed frame. It’s collapsible, foldable design means that it can easily be stored when not in use. Plus, since the set-up is very, very simple, it can be put into place and used minutes later. Since it has durable construction, it’s a long-lasting bed frame that can be used for years and years. Due to the fact that it provides so much support, a box spring is not needed for proper bed support and it also prevents a bed from sagging. Sitting higher off the floor, the space below the adjustable bed frame can be used for storage and is even big enough to place boxes and other items. Its black finish is actually very appealing to the eye and doesn’t detract from the look of any room, but actually adds to it. Can be used in any bedroom setting from those that feature modern styling to others that are more traditional due to the fact that its black finish is very versatile. Given that the bed frame adjusts while also being foldable and collapsible, it can be moved from place to place in a synch. So, if it needs to be moved from a main bedroom to a guest bedroom, that can be done quickly. The bed frame itself offers a great deal of support, providing a lot of comfort that leads to decent evening slumber. The bedframe is a bit on the heavy side at 71 pounds, which does make it more of a two person move rather than just one person. Due to the fact that the bedframe is so neutral in its look, it isn’t a good choice for overly decorated spaces since it won’t fit the style. Although the bed adjusts up and down, it can sometimes be cumbersome to move. So, what are you waiting for? If you’re short on space and still want to have a solid foundation for your bed, then look at getting an adjustable bed frame for your bed. You’ll be happy that you did when you get a good night’s rest night after night after night. It also comes in a king size version for those of you who need a larger area to sleep in. Adjustable beds are becoming extremely popular in 2015 and 2016, so keep your eye out for the best in the business. When you’re buying a bed that adjusts, you need to consider a lot of the same kind of things you’d consider when buying a new normal bed and adjustable bed reviews can be of assistance. You’re going to want to make sure that you get the right size first and foremost; after all, you can’t really enjoy the benefits of a “bed that bends” if you and your partner don’t have enough room. Just like your standard beds, adjustable versions comes in king size, queen size, full size, and twin size options. Another big concern for you should be the type of mattress you’re getting, and, once again, many of these are going to be the same as a traditional bed. For adjustable bed mattresses, your major options are going to be traditional spring mattresses, Memory Foam, gel, or even latex mattresses, all of which can provide different benefits to different types of sleepers, and are an essential part of your new bed system. Moving on to the adjustable bed frames, all of your major concerns are going to be related to one thing; your adjustable bed base now moves in three dimensions. All frames elevate your body to different, more comfortable positions, but they do have to move outside of their original position to do so; if you’re not careful, your new bed can bump into the rest of your furniture and start scraping into your walls. If at all possible, look for a wall-hugger designed adjustable bed; the wall-hugger design makes sure that your bed stays close to the wall (without going backward) no matter how much you adjust. You can easily check out a Leggett and Platt adjustable bed if this is a concern. Otherwise, take a good honest measurement of the area where you’re going to put your new bed and make sure it will fit; after all, you won’t feel very relaxed if every movement knocks something over. Once you’ve made all the regular considerations, it’s time to move on to your own personal needs to determine what you can get out of an adjustable bed system; fortunately, there are different versions for every type. If you find that getting out of bed in the morning isn’t just unpleasant but physically challenging, you’ll want to look into a bed that can be easily raised, as well as something that can support an additional adjustable bed rail. If you’re the kind of person who wants to use their bed for not just sleep but actual physical recovery, look into extra options like a massaging mattress and a zero-gravity feature that places your feet in such a way that they are at the same level as your heart, increasing circulation and helping recovery time. Perhaps you’re sharing this bed with a partner who has a different sleep schedule than you? You might want to look into a split king adjustable bed with a split feature. This way, one of you can be comfortably reclined while the other is asleep, without having to sacrifice comfort or control for either of you. Last, but certainly not least, is the element of style. While the technology for these king and queen size adjustable beds may have started in hospitals, you don’t have to buy one that looks like medical equipment. Thanks in large part to the improvements in the technology, as well as widespread support for its medical benefits, you can now find a mattress and adjustable bed frame to fit any decor. You can even choose a wireless model for your unit — place the remote in a drawer and hide the power cord under your bed, and nobody will even notice a difference. Whether you’re looking to throw out your old traditional bed, or you’re looking to improve the quality of your sleep, you can’t go wrong with an adjustable setup. All of the major brands such as Leggett and Platt, will give you options to help you do everything you do in bed more comfortably and without all the guesswork of cushions and body pillows. If all of this sounds good to you, please, take a look at our selection of some of the best adjustable beds for every type of person. Our adjustable bed reviews and the companies that supply them highly recommend you should start you upon your journey of the restful sleep you deserve. We want to help you make a solid investment in a good night’s sleep, one that will be with you and your family for years to come.